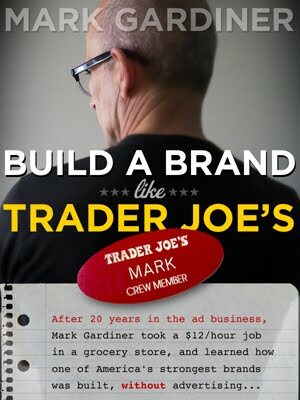 One of my favorite ad sites, ADWEEK, recently posted a short video in which Chiat/Day creative legend Lee Clow essentially supports one of the essential messages of "Build a Brand Like Trader Joe's". In the video, Clow stakes out a broader piece of territory for ad agencies, as he says that brands are more than just the sum total of ad messages, and include every point of contact from packaging to store design to online interaction. That's pretty standard stuff; ad agencies have to say that these days, because the share of budgets devoted to conventional media is falling, and unless they can consult on wider communications issues they'll have to lose revenue. That said, I like the way Clow wraps up the minute. In his view, 'winning' looks like creating an identity that consumers "want to spend time with." That's it, in a nutshell, and it sums up Trader Joe's strategy. When I first moved from California to Kansas City, I met with a top-ranked local graphic design consultant, Ann Willoughby, who's redesigned several big American brands. We talked about cultural branding, and I argued that the customer's direct emotional experience always overwrites any of the old design-and-advertising strategic branding techniques. Ann mentioned that her dream assignment had always been to completely redesign the Department of Motor Vehicles experience. I told her that, in fact, I had to go to the DMV to get Missouri license plates for my motorcycle the next day. She challenged me to apply my cultural branding theories to the DMV.